If your web development team has ever made a change to the files that comprise your live website, they may have asked you to “clear your cache” afterwards. Well, what the heck does that mean? 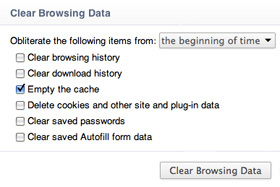 The process of clearing cache differs from browser to browser. Generally speaking, look for an option to delete cache or temporary files in your browser’s administrative settings. If you have Internet Explorer 9 or 10 click the gear icon in the top right. Click on the Settings button in the top right of the browser. (It looks like a wrench or three horizontal lines). Select only "Empty the Cache." In the dropdown that reads "Obliterate the following items from" select "the beginning of time." If you’re a fan of using keyboard shortcuts to get around, Control, Shift, Delete (for Windows) or Command Shift Delete (for Mac) will open the configuration pane to clear cache in any browser. What do I do after I’ve cleared my cache? Remember, after clearing your cache in any browser, refresh the page you are viewing so your browser has a chance to grab the fresh files.